And now we turn to a truly sad bit of news today. We unfortunately have to report that famed design artist, Yasushi Nirasawa, has passed away at 52. And while that name may not immediately evoke a response, if you’re a fan of the Kamen Rider franchise then you undoubtedly have seen Mr. Nirasawa’s work whether you realized it or not. Though Mr. Nirasawa has worked with the franchise since Blade he’s most often remembered for his work on Kamen Rider Den-O as the designer behind the Imagin. Today marks the passing of an immense figure in the tokusatsu world. While Den-O is of course my personal favorite of his works, Mr. Nirasawa had his hands in a number of series familiar to fans. I’d like to take this moment to personally say that without this great mans’ vision and talent I don’t know how I would have ever gotten hooked on Kamen Rider. His designs gave birth to the powerful characters & personalities that first got me into the franchise. Whether breathing life into the terrifying and menacing Worms & Undead of Kamen Riders Kabuto & Blade respectively, or the heartwarming & fun antics of Den-O’s Imagin, Mr Nirasawa brought a special something to every thing he touched. 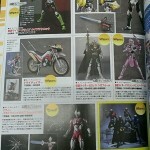 A new round of magazine scans has begun circulating the Internet! *Kamen Rider Marika, the Peach Energy Rider! *Kamen Rider Zeronos Vega Form, a fusion of Imagin and hero! Both items are Tamashii WebShop Exclusives set for release in July 2015. Marika has a price tag of 5184 Yen while Vega Form costs 5940 Yen. Let’s Watch Wednesdays FINALE Onigashima Warship & Cho Den-O Trilogy! Picking up just after a brief crossover in Kamen Rider Decade, Onigashima Warship sees a small army of Oni transported from the past to the year 1980. Here they seek the key to the Onigashima Warship, literally their last trump card. With the young boy Yu and a little help from Kamen Rider Decade, can the Den-Liner crew repair the past and fix the de-aged Ryutaro or return the vanished Yuuto? A passing through rider or two, plenty of body snatching, and form changes abound! And the finale, the Cho Den-O Trilogy! The first film, Episode Red, features Kamen Rider Zeronos and Airi Nogami sorting out the sordid history (and future) of their love. Episode Blue features New Den-O & Teddy. Friends from the future, can these inheritors of the Den-O legacy survive the past and return to their future? 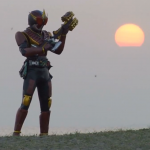 And finally Episode Yellow focuses on, Kamen Rider Diend?! That’s right, the thieving hero/crook from Kamen Rider Decade has come to (sort of) right the wrongs of his own past. 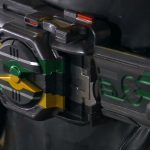 But being pursued by the new Kamen Rider G Den-O brings it’s own problems. With time travelling hijinks, more than a few double crosses, precious mementos, and at least one insane artificial Imagin, is it any wonder Diend is here? Have no fear, this time Diend steals the show with his Complete Form! Let’s Watch Wednesdays Week 18 Den-O 49, Climax Deka, & Final Countdown! This is the end folks! The Kamen Rider Den-O TV Series ends here! But don’t let that stop you, we’ve got 1 episode to view this week and 2 movies! All of time is at stake and the child of Airi & Yuuto is revealed! Den-O, Zeronos, Momtaros, Urataros, Kintaros, Deneb, Hana, Naomi, and even Sieg! Everyone is here for the end. It’s all come down to this, the Imagin must destroy the future they’ve come from to save the world that’s meant to be. Can they survive?! Climax Deka is here! With the battle against Kai over, Team Den-Liner has taken on the task of policing time and destroying rogue Imagin. But one, Negataros, will use the power of Nega Den-O and create his own evil organization. The only way to stop him? 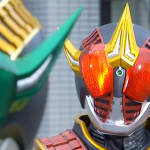 Team up with the one and only Kamen Rider Kiva! And, it’s the Final Countdown. Two new trains of time have appeared! 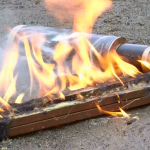 The Ghost Train controlled by the evil Kamen Rider Yuuki and, New Den-Liner?! The hero of a future 50 years from now and Ryutaro’s grandson, Kamen Rider New Den-O, arrives with his Imagin Teddy to protect the present. An unprecedented team-up of Den-O and the Imagin is at hand for the final explosive battle! But that isn’t even the end! We’ll be back next week with another trip down memory lane with a Den-O movie! Den-O & Decade Neo Generations: Onigashima Warship! Following that will be the FINAL week of Den-O on Let’s Watch Wednesdays with the Chou Den-O Trilogy of movies! Let’s Watch Wednesdays approaches the end of everything with Kamen Rider Den-O! The key to the past, present, & 2 futures lies with Airi Nogami, or more accurately, her unborn child! The child of Airi & Yuuto is the key to the Junction in time. Forgotten by time itself this child is too protected for even Kai to reach. Instead he’ll rampage an army of Imagin through time, even hijacking Den-Liner! One by one the Den-Liner crew will make their last stand as the battle for everything that will ever be comes to it’s conclusion! Tune in next week for the finale of the Kamen Rider Den-O TV Series! On the topic of actors again this week, let’s talk about our main hero Den-O/Ryutaro Nogami. The young Takeru Satoh made his debut in toku as the titular rider and played Den-O over the course of the entire 49 episode series as well as the first 3 movies. And although many tokusatsu alums tend to stick to their genre or return to it later, Satoh has done neither. To this day Kamen Rider Den-O is Takeru Satoh’s only tokusatsu credit. After leaving the franchise in 2008 and having a string of jobs in the interim Satoh made an explosive debut again as another hero, this time ripped from the pages of manga. In 2012 he emerged as the titular hero in the first film of the Ruroni Kenshin live action trilogy! Satoh reprised this role for both sequels as well; The Great Kyoto Fire, & The End of A Legend. Let’s Watch Wednesdays returns from a couple weeks on hiatus back to Kamen Rider Den-O! Zeronos has returned, but that may be all the good news our heroes will have for now. Yuuto Sakurai, the older one, disappeared some time ago. That fateful day by the lake, the circumstances of it are known only to Ryutaro. If Yuuto Sakurai no longer exists in the memories of others, how can we be sure Ryutaro actually knows what happened? Kai counted on erasing Yuuto from time to connect his future to the present, but he didn’t count on Ryutaro’s memories. And if the two times don’t connect, Momotaros & the others will disappear along with their time, forever. Now that contested moment in time will be revisited by all parties involved. But who actually knows the truth? Back to actors! If you didn’t pick up on it yet, you may have seen Kamen Rider Zeronos’ actor before. Yuichi Nakamura, is the man we’ve come to know and love as the younger Yuuto. However don’t confuse him with the actor of the same name who voiced Beet J Stag from Go-Busters. This is the Zeronos Yuichi Nakamura. In any case Nakamura once had another role on an older rider series, Kamen Rider Hibiki! 2 years before he became Yuuto/Zeronos he played Kyosuke Kiriya, who would briefly transform into the at the time unnamed Kamen Rider Kyoki! His role as Kyoki may not have been as long as Zeronos but it’s always fun to see which characters toku actors have played previously. Let’s Watch Wednesdays returns to Kamen Rider Den-O but with the loss of one of our heroes. In case you haven’t noticed we’re rocking a Thursday Edition this week. Techincal difficulties on my end being to blame. But we’ll be back to normal next week. Yuuto paid the ultimate price when his past self was erased from time. Or so it would seem. The Zeronos cards aren’t all bad after all. While the memories of a person disappear, they are protected from the ravages of time. But with no more green cards left, Yuuto must now resort to the red cards and an even greater price must be paid as well. The memories Yuuto’s made in the present will now cease to be. His past no longer exists, and now neither does his present, nor would it seem does his future. But one thing is certain, Zeronos Zero Form is a power to be reckoned with! It’s time to see if you were paying attention again! This week the show changed up something most people skip right past, the opening! That’s right, the usual rendition of Climax Jump you’re used to was replaced this week by Climax Jump Den-Liner Form. A rendition of the song sung by our lovable Imagin! Episode 40 is the first instance where the opening theme changes and the first where clips from the episode you’re about to watch are inserted into the montage. Of course this isn’t the only alternate version of Climax Jump out there. In fact when Climax Jump was released as a Single there were 5 versions of the song just on that disc. But there are multiple other versions of the song each tied to a particular form of Den-O as well as several more official remixes of it. I actually know of at least 12 more versions of the song out there, bringing the total close to 20, all of which I have of course. 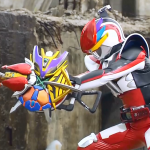 Kamen Rider Den-O is approaching it’s final stop with Let’s Watch Wednesdays! As we approach the end, here’s where we stand. With the debut of Liner Form things should be headed the right direction. Wrong. It seems Ryutaros was originally sent back in time to kill Ryutaro! And the one who sent him was someone from the Imagin’s future, Kai. But Ryutaros stands with his friends, so Kai sets his sights on Yuuto! In an effort to erase Yuuto from time, Kai will send an Imagin to his past. Will he succeed? Can Kamen Rider Zeronos be erased forever? Find out now. Did you notice something familiar this week? You may not have immediately recognized them but they’re there. Notice that Kai’s right hand man in his first appearances is the Leo Imagin. Leo has 3 underlings with him, the Leo Soldiers. Take a good look at their suits. Stll don’t see it? 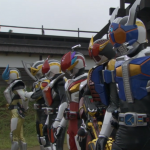 Those are in fact 3 Zectrooper suits from Kamen Rider Kabuto! As is often the case in tokusatsu productions costumes are rehashed, reused, and canibalized for the sake of whatever the current production is. The Zectrooper suits were no different. These rider like characters were seen in large groups in Kabuto so it seems Toei could spare 3 suits to retrofit for Den-O. With their antennae removed, bug eyes covered in gold jewels, and the armor parts of their suits painted in gold it’s not surprising most people have never noticed this. Kamen Rider Den-O has pulled back into the station for another round of Let’s Watch Wednesdays @ Tokunation! Memories are time. As long as people hold onto them, the time erased by Imagin can be restored. Even the people lost can return. But if no one remembers you, you fall through the cracks of time ,travelling until you are remembered. The Sakurai Yuuto of the future has returned with more cards, forcing the young Yuuto to become Zeronos once more, and dooming him to fall through the cracks of time. Now Ryutaro’s determination to be stronger is greater than ever. To keep Yuuto from needing to transform and destroy more memories of his life, something greater must be created. Ryutaro will use his own power, Den-Liner, and the 4 Imagin to create Liner Form! We told you about the voice of Deneb, but now we’re looking at the man behind everyone’s favorite Imagin, Momtaros! Momotaros is brought to life by legendary voice actor Toshihiko Seki! Though his list of previous toku credits is primarily bit roles (Chameleon Nejire in Megaranger, Zebra Fangire in the Kiva Movie) Seki has been prolific as an anime actor. His credits include: Rau Le Creuset in Gundam SEED, Duo Maxwell in Gundam Wing, Legato in Trigun, Iruka Umino in Naruto, and many other roles that span his nearly 30 year acting career. 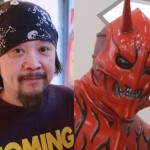 Mr. Seki has continued to voice the role of Momotaros since Den-O’s TV series began, even continuing the role all the way to this years Hesei Vs. Showa Featuring Super Sentai film! And it looks like there’s no end to this role in sight! TokuNation is back with another exciting climax in Kamen Rider Den-O for Let’s Watch Wednesdays! As Yuuto continues to struggle with the final Zeronos Card, their secret is revealed. Airi can’t remember any version of the Sakurai Yuuto she once loved. Because every time one of Zeronos‘ cards is used something incredibly important is lost, memories of Sakurai Yuuto! Each card contains a memory someone else has of him. And a new line has appeared in time twisted and mangled, this line doesn’t connect to Den-Liner, yet. But its tremors are being felt across time. No one will know that better than Hana. Could this line cross into her destroyed time? Where does it lead to, the future? Or the past? You may have noticed something big changed this week. And that’s Hana’s actress! For reasons we’ll find out later within the shows plot, Hana has regressed in age to that of a child. Some of you may even have noticed that Hana’s original actress, Yuriko Shiratori, last appeared in episode 30. After Ore Tanjou her involvement began to decline somewhat but she abruptly left the show at episode 30. So you’ll notice the ignorance of her absence by the shows plot. In the real world what happened was Yuriko Shiratori became very over worked while doing the show and she’s said to have exited the franchise because of health problems related to this. Other reports have variously claimed over the years that she was injured filming a stunt for the show and refused to return because of it. Whatever the case may be she left the show and never returned. Which may be a big missed opportunity for the young actress as Den-O went on to become the longest lasting franchise in Kamen Rider and by far one of the most successful. But her replacement Tamaki Matsumoto stuck with it as Kohana for years, all the way into the Cho Den-O Trilogy!